After more than a decade of relative calm, the customer relationship management software industry is again delivering innovation—with software as a service (SaaS), cloud computing, CRM analytics, mobile CRM, social CRM and new innovative consumer technologies. In fact, the consumerization of enterprise IT in part stems from the sky-rocketing adoption of cloud CRM systems. We also like to recognize other folks and websites that offer unbiased and helpful information to CRM buyers, software implementors and practitioners. 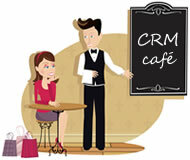 Recommendations of great independent CRM content can be forwarded to info[at]crmcafe.com. Be advised that we generally don't reference CRM vendor websites and we seeking independent content. Thanks for visiting and continued success in acquiring, serving, satisfying, maintaining and engaging you customers.